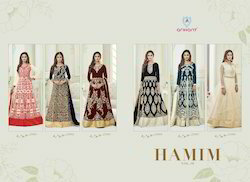 Offering you a complete choice of products which include lt nitya vol 104 nx suits, fiona zara vol 3 mallika arora anarkali suits, designer georgette green color anarakali suit, aashirwad almirah vol 3 anarkali suits, glossy - simar-10 anarkali suits and sajawat creation rossell vol 3 suit. 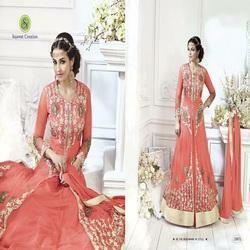 Party Wear Designer Dress is a form of women's dress which has recently made its way back to the Indian fashion scene. The anarkali suit is made up of a long, frock-style top and features a slim fitted bottom.The anarkali is an extremely desirable style that is adorned by women located in Northern India, Pakistan and The Middle East. 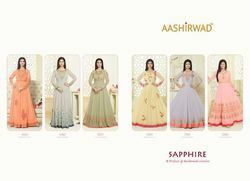 The anarkali suit varies in many different lengths and embroideries including floor length anarkali styles. Many women will also opt for heavier embroidered anarkali suits on wedding functions and events. The kameez of the anarkali can be sleevelesss or with sleeves ranging from cap- to wrist-length. An Fancy Anarkali Top is a form of women's dress which has recently made its way back to the Indian fashion scene. 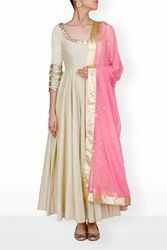 The anarkali suit is made up of a long, frock-style top and features a slim fitted bottom.The anarkali is an extremely desirable style that is adorned by women located in Northern India, Pakistan and The Middle East. The anarkali suit varies in many different lengths and embroideries including floor length anarkali styles. Many women will also opt for heavier embroidered anarkali suits on wedding functions and events. The kameez of the anarkali can be sleevelesss or with sleeves ranging from cap- to wrist-length. An Fancy Full Anarkali Top is a form of women's dress which has recently made its way back to the Indian fashion scene. 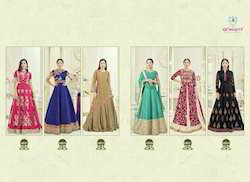 The anarkali suit is made up of a long, frock-style top and features a slim fitted bottom.The anarkali is an extremely desirable style that is adorned by women located in Northern India, Pakistan and The Middle East. The anarkali suit varies in many different lengths and embroideries including floor length anarkali styles. Many women will also opt for heavier embroidered anarkali suits on wedding functions and events. The kameez of the anarkali can be sleevelesss or with sleeves ranging from cap- to wrist-length. An Fancy Anarkali salwar suit is a form of women's dress which has recently made its way back to the Indian fashion scene. The anarkali suit is made up of a long, frock-style top and features a slim fitted bottom.The anarkali is an extremely desirable style that is adorned by women located in Northern India, Pakistan and The Middle East. 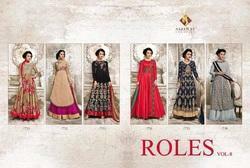 The anarkali suit varies in many different lengths and embroideries including floor length anarkali styles. Many women will also opt for heavier embroidered anarkali suits on wedding functions and events. 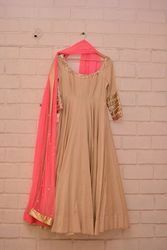 The kameez of the anarkali can be sleevelesss or with sleeves ranging from cap- to wrist-length.